Copper commemorative coin belonging to Amos Wright. 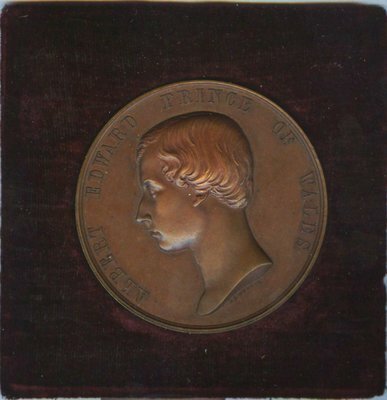 The coin marks the visit of Albert Edward, Prince of Wales (future Edward VII) to Montreal for the opening of the Victoria Bridge. Enclosed in original box (damaged). Made by Joseph S. Wyon, Chief Engraver of Her Majesty’s Seals. Prince of Wales's feathers is engraved on the reverse side of the coin. The motto "Ich Dien" on the ribbon is German "I serve".